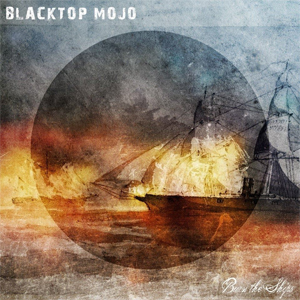 Texas based hard rock band BLACKTOP MOJO has released the official music video for "Prodigal", off of their most recent LP, Burn The Ships. A hard-driving Southern rock unit based out of Palestine, Texas, BLACKTOP MOJO's fiery blend of post-grunge, classic rock, and metal falls somewhere between SOUNDGARDEN, BLACK STONE CHERRY, and LYNYRD SKYNYRD. Founded in 2012 by frontman Matt James and drummer Nathan Gillis, the band eventually morphed into a five-piece with the additions of bass player Matt Curtis and guitarists Ryan Kiefer and Chuck Wepfer. They released their debut album, I Am, in 2014, followed by a heavy bout of touring that saw the group sharing the stage with a wide array of heavy hitters, including Bon Jovi, Sammy Hagar, Candlebox, Darryl “DMC” McDaniels, Black Stone Cherry, Shaman’s Harvest, Pop Evil, Puddle of Mudd, Drowning Pool and many others. In 2017, the band teamed up with Muscle Shoals producer Jimmy Johnson for their sophomore outing Burn the Ships. The album was released via the band’s label, Cuhmon Records, in March of that year to critical acclaim. The record yielded two Top 40 hits on the Billboard Active Rock charts, with singles, "Where The Wind Blows" (#27) and the band's cover of the AEROSMITH classic, "Dream On" (#31). Throughout the rest of 2017 and 2018, the band toured heavily around North America in support of their record, getting added to major rock festival bills such as River City Rockfest, Louder Than Life, Rock Allegiance, The 25th annual Rockfest, Shiprocked, and many more. The band continues to all live together in "The Mojo Mansion" in Palestine, writing songs, recording and preparing for their 3rd full-length studio album entitled Under The Sun for release in 2019.